We are proud to announce our partnership with the GPAA and can’t thank them enough for their fundraising efforts for AMRA and the legal fund. As a part of this partnership, we are going to have many joint access claims with the GPAA in multiple states. Some of the claims are current AMRA claims which will become both GPAA and AMRA claims. We have been working closely with Kevin Hoagland on geographical locations which the GPAA is highly interested in and have folks in the field as we speak mining some of these new locations. Due to the over-regulation by USFS, BLM and other agencies, there are lots of folks just letting their claims go…..we are mining those open areas right now and plan to announce these new claims shortly as they appear to be panning out quite well! As many of you know, we had a meeting with several of the leaders in the small mining industry recently in California and talked about new strategies on over-regulation and litigation, both past and planned. There have been a multitude of lawsuits lost in CA by other organizations and we are skeptical on whether or not one can get a fair trial in that state. California courts seem to care more about ideology than what our laws, or their regulations actually say. Part of this strategy is if there needs to be litigation, choose the states in which a fair trial is likely, hire outstanding attorney’s with a wealth of experience on the issues brought forward and fight like hell. With the settling of the CEQA case in California recently, the small miners are essentially at the mercy of the California Water Board and the Dept of Fish and Game now. Highly restrictive regulations and expensive permits to dredge. California is nearly intolerable to live and mine anymore…which is precisely what the opposition and those on one side of the political spectrum surely wanted all along. We need precedence setting cases which can have impacts on all states with mining claims and even impact those which don’t. A miner should not have to wait for 3 years to obtain a Plan of Operations (PoO) with the USFS….and counting. A miner shouldn’t have to argue that it is reasonable, and a fundamental right for a 82 year old handicap man to use the road to his claim which has been in existence for over a 100 years, and making that 82 year old man hike 3 miles from the rocks the agency put up to block access is the definition of unreasonable and in violation of the ADA, RS2477 and their own governing documents. We sure don’t have any shortage of miners coming forward with solid cases in Montana, Idaho and Colorado. There is not a week which goes by where we aren’t contacted by a miner with these very problems….each week, every week. We need to unite, end the division in our community and join hands. Truly, honestly and sincerely join together and fight like our lives depend on it. As an example, we’d be willing to bet there will be some person who posts some divisive post below. There should not be sides here, we are all on the same side are we not? This is the biggest challenge we face, and which has been faced by all of the groups, associations and folks who have been fighting for years. The agencies should fear all of us as much as they do the environmental groups out there who file suits right and left. Our representatives should know your names and be hearing from you whenever issues come up which infringe upon your fundamental rights. It is a sad fact that most do not even know who their representatives are, that needs to change. We do plan on having another meeting with many more members of the community, but have not set a date for that yet. Once we do, we’ll announce it and have an RSVP sign up. Back to the GPAA and claims: As we add these joint claims with the GPAA, we will announce them, but can start with we have given them one of our claims in Idaho on the SF Clearwater to the GPAA, are opening up one of our claims out of Quincy CA to the joint partnership and are filing several new claims with them (they will be GPAA owned claims) in Arizona. These are the best of the best and we are extremely excited to join in this relationship. The plan is for a dozen or more claims, and we fully intend to make that happen…and soon! 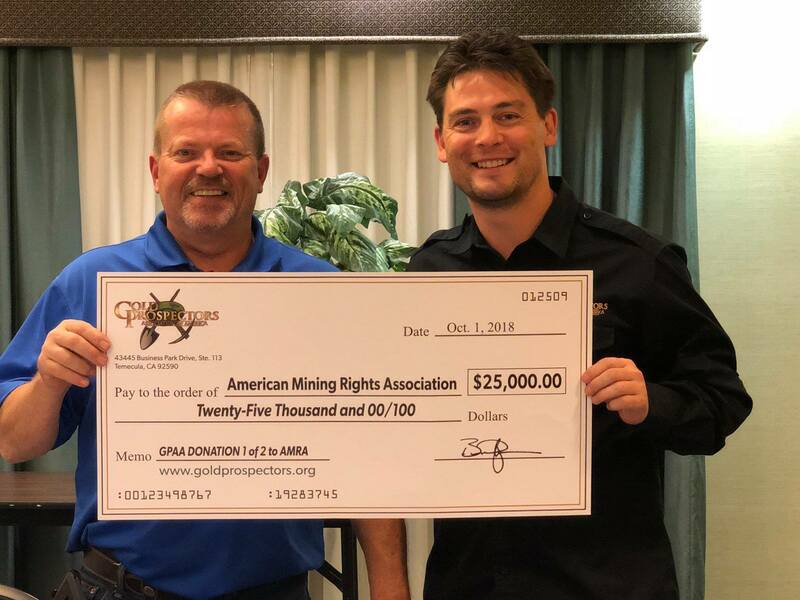 Thank you very much to the GPAA for the support and AMRA members should be proud and excited to see this level of unity in the small mining community. Please join us in thanking Brandon and his team for these amazing efforts.